Mere Christianity, C. S. Lewis’s eloquent and winsome defense of the Christian faith, originated as a series of BBC radio talks broadcast during the dark days of World War Two. Here is the story of the extraordinary life and afterlife of this influential and much-beloved book. 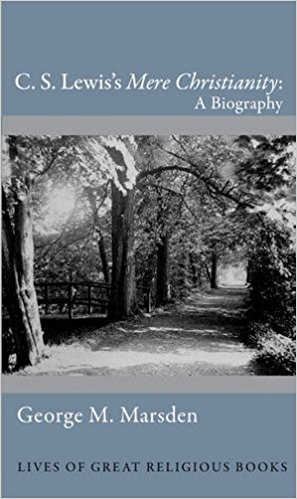 George Marsden describes how Lewis gradually went from being an atheist to a committed Anglican–famously converting to Christianity in 1931 after conversing into the night with his friends J. R. R. Tolkien and Hugh Dyson–and how Lewis delivered his wartime talks to a traumatized British nation in the midst of an all-out war for survival. Marsden recounts how versions of those talks were collected together in 1952 under the title Mere Christianity, and how the book went on to become one of the most widely read presentations of essential Christianity ever published, particularly among American evangelicals. He examines its role in the conversion experiences of such figures as Charles Colson, who read the book while facing arrest for his role in the Watergate scandal. Marsden explores its relationship with Lewis’s Narnia books and other writings, and explains why Lewis’s plainspoken case for Christianity continues to have its critics and ardent admirers to this day. With uncommon clarity and grace, Marsden provides invaluable new insights into this modern spiritual classic.